No part of this article can be copied or distributed without the express, written permission of the author. All rights reserved. Of the many environmental organizations active in the 1990s and 2000s, the Truckee River Yacht Club deserves notice because of its central position in all that was happening in regard to the river. Part lobbyist, part community instructor, part historian and part current-events reporter, it was important not just for itself but for the tireless and passionate efforts of its members. They were active not just in the club but as individuals in numerous movements and organizations fighting to return the Truckee to a more natural state. The Truckee River Times Newsletter was written by Susan Lynn and was a source of river information for Club members, activists, and policy wonks alike. “It began from the Cheerful Women’s Breakfast Club which really didn’t meet for breakfast—only for drinks after work. Peggy Bowker and I started it from talking about whether or not one would wear a T-shirt promoting the Truckee (so mundane, but germane at the time) and whether we could develop the community’s interest in a flood-control project. While the name soon gained recognition in the community as that of a river advocate, it proved a puzzle to the wonderfully wacky world of the Internet. Here and there, one could find it listed as a venerable yachting organization where a person could rent sailing vessels and consort with fellow yachters. It also was listed as everything from a social organization, to a business providing services for clubs, and a private company for which annual revenues and employment figures could be discovered by joining the appropriate website. In any event, the first four members were joined by Adele Malott and Don Vetter, and in September of 1990 the organization incorporated. Lynn was executive director of Public Resource Associates and would later serve on the Washoe County Regional Water Planning Commission, then on the board of directors of the Great Basin Water Network, a coalition of approximately forty organizations opposed to the exportation of rural Nevada water to Clark County. Bowker was a founding member of the Arizona Floodplain Management Association and after moving to Reno founded Nimbus Engineers, an engineering firm specializing in floodplain management; she helped create and was president of the National Flood Determination Association. Strickland and Ghiglieri were a married couple, longtime officials of the Toiyabe Chapter of the Sierra Club, prominent birders and activist leaders in issues involving the public lands and water. Vetter was a former reporter for the Reno Gazette-Journal and at the time public affairs officer for Washoe County; later he would work in advertising-public relations and eventually create his own firm, Don Vetter Public Relations. Malott and her husband Gene were longtime reporters and publishers who in later life wrote a column for mature travelers; she was an ardent supporter of local activists, and the couple would create a prize for Recording Community Activism. Another important member was artist Nancy Peppin, who designed the Truckee T-shirts with a sense of humor. Lynn, Bowker, Strickland and Ghiglieri would all serve on various committees of the Community Coalition that was created to develop a flood-control plan for the river following the disastrous Truckee River flood of 1997. Upon Malott’s death in 2005, Janet (Carson) Phillips, Joe Cendagorta, and Susan Donaldson joined the board. Phillips had been a long-time water expert for Sierra Pacific Power Company and later founded the Tahoe-Pyramid Bikeway association dedicated to building a bicycle trail the length of the river. 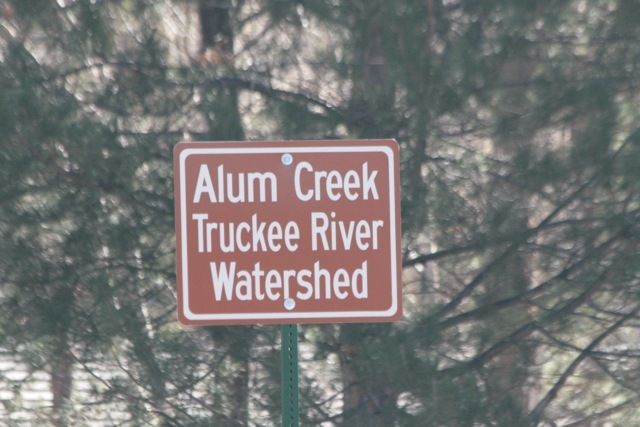 (See “Tahoe-Pyramid Bikeway”) Cendagorta was on the board of Truckee River Flyfishers. Donaldson was a professor with the University of Nevada Cooperative Extension and a member of the Nevada Weed Management Association. In the years after its founding, the Yacht Club settled in for the long and arduous task of convincing the community that a river was not the best place to locate industrial facilities and other commercial enterprises, and that floods could be better and more cheaply dealt with by not confining the Truckee within a mass of concrete walls and levees that in the end were never sufficient to protect adjacent land. They argued that these measures and channel dredging destroyed the natural rhythm of the river and severely injured the wildlife that depended upon it, and that instead the river should be celebrated as the natural wonder it was by re-creating the original meanders, restoring its scenic and life-supporting vegetation, and lining it with paths and resting areas that would make it the full-fledged recreational and tourism asset it ought to be. The club sponsored or assisted riverbank cleanup days and other projects, promoted conservation of water resources, and sought grants for itself and awarded them to others. It took people floating down the river on rafts so they could see and learn from a different perspective; these river travelers contemplated good locations for wetland and riparian restoration but often saw whitetop weeds overgrowing native vegetation. Moonlight summer walks created another perspective of what the river was and could be. The club sponsored the stenciling of storm drains to warn citizens not to dump toxic substances that would make their way into the Truckee. It emphasized noxious-weed management and wrapping the vital cottonwoods in protective wire to prevent the beavers from destroying them. It worked with youngsters, including Scout groups. Its members wrote innumerable letters to officials, and urged others to do the same. 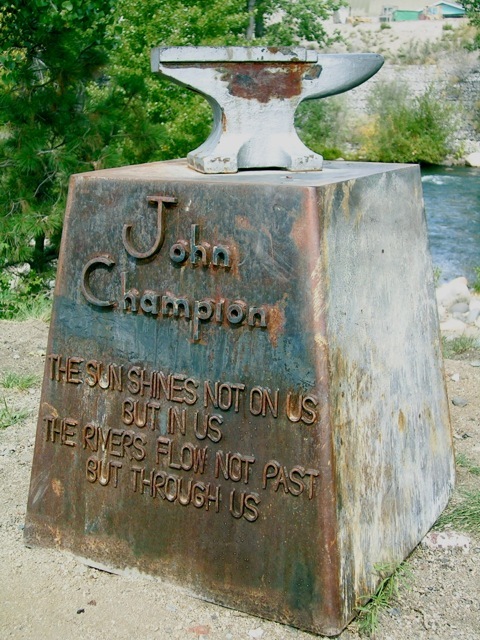 It presented the Silver Sculpin Award to those who had done yeoman work for the river (the sculpin is a native Truckee fish whose condition is an indicator of river health). And it printed The Truckee River Times, an irregularly published newsletter which tied everything together, upstream and downstream. Perusing the pages of the Times, one is amazed at the bustling history of these environmentally active years. Who knew that so much was going on, that there was such a proliferation of movements and organizations? Times readers knew. They also received thumbnail history lessons, such as the two-part series by Chad Gorley of the Nature Conservancy (“Historic Overview of Modifications to the Truckee River Ecosystem” plus “Restoration”). Occasionally they were given poems to swell the soul. The placing of Rocks in the River, mentioned above by Lynn, took place in 1994 and consisted of installing ten boulders just off the Riverwalk in downtown Reno in order to provide visual relief and improve fish habitat during low flows. In 1995 when Western Nevada Clean Communities sponsored an Adopt-a-Park cleanup, the Yacht Club provided captains for the river parks, as it would do again in succeeding years. During the 1996 Adopt-a-Park, the club manned an Earth Day booth to educate people about the river. In 1997, attorney Ted Schroeder contacted the club about 43 acres of river land that might become available in an estate; this land south of Mogul was eventually purchased by the Nevada Department of Wildlife and Washoe County Parks. Elsewhere, the club helped the Truckee Meadows Trail Association rebuild the interpretive trail at Dorostkar Park. And it opposed a city downtown redevelopment plan to build a movie theater beside the river at Sierra and First streets. “A movie theater has no relation to the river,” it editorialized. “Why would anyone think this is a good river-front use? Builders will be allowed to build right up to the old building footprint instead of the city widening the channel for flood capacity.” Despite these efforts, the theater would eventually be constructed, although with a setback from the river. But nothing was done to widen the river downtown. In 1998 Strickland gathered the leaders of numerous groups to convince the Forest Service to accept land in Hunter Creek canyon, including Truckee River frontage and a section of the Steamboat Trail. Also, the club received a grant to buy plants and trees to restore flood- and beaver-damaged areas under Champions of the River. In 2001 Lynn stepped down as commodore and Ghiglieri replaced her. The club offered its support when the Nevada Commission on Tourism began promoting a Truckee River Recreation Plan for a continuous bike/pedestrian path under the bridges, as well as a downtown whitewater kayak/rodeo site, the creation of safe river access points, and the removal of obstructions dangerous to boaters on a stretch reaching from Crystal Peak possibly as far as Lockwood; a chief result was the 2003 construction of the highly popular Whitewater Park in downtown Reno, and a similar one later in Sparks, which in part re-created the club’s Rocks in the River on a much greater scale. “We want our river to dance, sing, and sparkle,” said the Times. “We allow space for people. We encourage entertainers and vendors, shopping and outdoor dining, restrooms, shade in the summer and sun in the winter. We plant trees to create a green ribbon, a welcome relief of softer neon. … We want Reno to be special! A lively space where one can experience stark contrasts—a break from the sights, sounds, smells and experiences of the rest of the city. Must we accept the ordinary? No! We must expect and ask for the exceptional.” Of course, along with this enthusiasm for downtown revival, the club’s leaders probably hoped that if people came to experience a revitalized river downtown, that enthusiasm might extend to the rest of the Truckee. Throughout these years, readers were also kept abreast of the restoration activities of the Pyramid tribe, including its rearing of Lahontan cutthroat trout. Of the larger river issues that consistently concerned the Yacht Club, one involved assuring adequate instream flow to guarantee healthy living conditions for fish. The club promoted a “safe zone” of between 100 and 200 cubic feet per second, explaining that at 50 cfs fish begin to die from lack of oxygen. It chided Nevada for being the only Western state to have no law requiring minimum flow. In 1995 it urged a successful conclusion to the Senator Harry Reid’s Negotiated Settlement talks, in which almost all water users would agree to create a better system of managing this precious resource both for themselves and for the river. The club hoped the talks would permit secondary storage in the upstream reservoirs for use during low-flow periods. But it warned that “The sad part of all this discussion is that the river often suffers because of the old adage that water flows to money and not towards protection of the resource itself.” However, the talks concluded successfully, and then the Yacht Club effectively urged widespread support for the Truckee River Operating Agreement, the outcome of the settlement, which when completed would flesh out its terms. Another possible method of assuring adequate instream flow lay in acquiring fractal water rights. These were small rights that private individuals held on land that had become streets, parking lots, freeways and certain residential properties. It was estimated that these could add up to a significant 32,000 acre-feet. By 1997 the club was working with the Desert Research Institute to determine whether that estimate was correct and if so, whether these rights could be donated to the club or some other nonprofit. By 2004 an avenue for acquisition had been created and the Times was urging its readers to donate or sell their rights to Great Basin Land and Water and Truckee Meadows Water Research. Another part of the solution came in 1996 with the Truckee Water Quality Agreement under which the Pyramid Lake Paiute Tribe agreed to set aside its water -quality lawsuits in return for Reno, Sparks, and the federal government acquiring $24 million in rights to be stored upstream and released when needed. “Why are we not managing this river as an ecosystem, a watershed?” she asked. “The river is not just an economic unit. We can’t measure all its values in terms of dollars. But if we did couch the river in dollars only, we should put in a pipeline and forget we have a river. “[Federal, state, regional interests, cities, counties, the tribe, ditch companies and the water utility] often don’t talk to each other and work at cross purposes. [There is] no central clearinghouse or centralized management agency for the Truckee River.” As an example, she cited the contradictory actions of the Reno-Sparks sewer plant and Storey County—the former reducing nitrogen and phosphorous outflow to meet federal, state and tribal water-quality standards while Storey was selling riverside lots whose septic systems would eventually discharge into the river, undoing the good done by the sewer plant and the restoration of Steamboat Creek. What the area needed, Lynn said, was a single Truckee River Management and Coordinating Agency and Board to which all other agencies would report. But no such agency was ever crafted. “We have 78 agencies with jurisdiction … [and those that are trying to accomplish something] run into inertia at the planning commission and governing board level. In the meantime, we are letting the river slip away until it will be too expensive or too developed to do anything…. In April of 1998 the Times devoted a full newsletter to the proposed flood-control project and what it saw as the faulty levee-floodwall approach vs. the much more intelligent flood-management approach. It warned that the former would not prevent future flood damage. It urged the community to just say “No” to dredging, and turn to more natural approaches. The club reported hopefully on a 1999 meeting of locals with Napa, California officials who had convinced the corps to help develop a Living River flood-control plan for their community, a plan emphasizing natural river processes as much as possible. When a Truckee River Community Coalition was created in April of 2001, the club and other activists argued strenuously for a similar Living River plan. Eventually this plan garnered wide public and official support and became the preferred local plan, although by 2013 the Corps of Engineers, after dallying for 15 years, was still studying the issue, and the governments were backtracking from a full Living River approach because the Great Recession had severely depleted their financial resources and because federal assistance seemed uncertain and far too little. In the mid-2000s the club stopped printing the Times but remained otherwise active: for instance, supporting cleanups and giving grants, such as a $4000 donation to the Sheriff’s Office in 2012 so work crews could once again wrap several species of trees to protect them from beavers.